Compatible with our EcoPure ECOP30 system, these replacement filters are stages one and three in the reverse osmosis filtration process. Made using a high-quality activated carbon block, the ECOROF filters feature a highly adsorptive, positively-charged material that removes greater amounts of impurities from your water than you'd get with a sediment filter. Their encapsulated filter design feature means filter changes are quick and mess-free. No tools. No need to shut off water supply. No touching dirty filters. For best filtration results, please replace your ECOROF filters every six months, as recommended. Convenient encapsulated filter design means water filter changes are quick and mess-free. No tools required. No need to shut off water supply. No touching dirty filters. Faucet light tells you when it's time to replace your filters. Sign up for filter change reminders on the EcoPure website. Extend your ECOP30 warranty to a lifetime warranty by registering your product on EcoPure's website and and uploading replacement filter purchase reciepts twice a year. For warranty information, please call 1-800-247-1087. 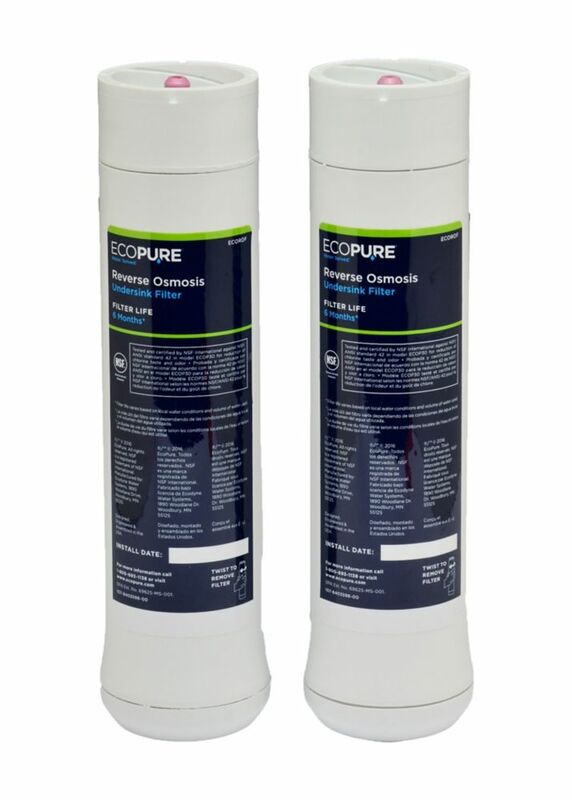 Reverse Osmosis Replacement Filter Set Compatible with our EcoPure ECOP30 system, these replacement filters are stages one and three in the reverse osmosis filtration process. Made using a high-quality activated carbon block, the ECOROF filters feature a highly adsorptive, positively-charged material that removes greater amounts of impurities from your water than you'd get with a sediment filter. Their encapsulated filter design feature means filter changes are quick and mess-free. No tools. No need to shut off water supply. No touching dirty filters. For best filtration results, please replace your ECOROF filters every six months, as recommended. Reverse Osmosis Replacement Filter Set is rated 4.5 out of 5 by 28. Rated 5 out of 5 by Flygirl from Installed all three filters within 20 minutes. No need to turn off water supply to install if you... Installed all three filters within 20 minutes. No need to turn off water supply to install if you follow instructions. Rated 4 out of 5 by Gideon from Overall good quality. Easy to replace. The only problem is that the lithium battery shipped with ... Overall good quality. Easy to replace. The only problem is that the lithium battery shipped with the filters was no good so the warning light started flashing again after only 2 weeks. Rated 5 out of 5 by Peasy from So easy to install, good price. Works with our RO system which recommends wheerf filters, but the... So easy to install, good price. Works with our RO system which recommends wheerf filters, but the wheerf filters cost more. I have set up for auto delivery every 6 months, after 2 purchases I will have saved enough that it will be like getting the 3rd one free. There was that much difference in the price between the 2 brands. Rated 5 out of 5 by HomeDepotCustomer from Excellent service. Very Happy to help me finding right part... Excellent service. Very Happy to help me finding right part for my OSmosis Reverse water Filter system.Thanks. Rated 5 out of 5 by Park from I love this system! Used for 2.5 years now. Filters a cinch to order and change. Wateemr tastes ... I love this system! Used for 2.5 years now. Filters a cinch to order and change. Wateemr tastes much better than irony well water!